Thirty-four veteran politicians from Awami League and its allies have lost chance to continue their duties as ministers in the new 47-member cabinet. 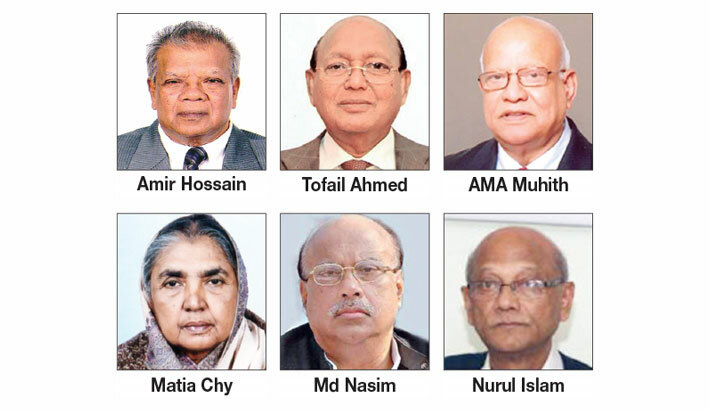 The heavyweights who will not be seen in the new cabinet include AMA Muhith, Amir Hossain Amu, Tofail Ahmed, Khandaker Mosharraf Hossain, Matia Chowdhury, Mohammad Nasim, Nurul Islam Nahid, Shajahan Khan, Mofazzal Hossain Chowdhury Maya, Abul Hassan Mahmood Ali, Qamrul Islam, Rashed Khan Menon, Hasanul Haq Inu, Anwar Hossain Manju, Mujibul Haque, Asaduzzaman Noor, Narayan Chandra Chanda, Mosharraf Hossain, Emaj Uddin Pramanik, Shamsur Rahman Sherif, Mostafizur Rahman Fizar and AKM Shajahan Kamal. Sources said new faces have been inducted into the new cabinet to bring dynamism in the government. Awami League president Sheikh Hasina is going to form a new cabinet comprising 24 ministers, 19 state ministers and three deputy ministers. President Abdul Hamid will administer oath to the cabinet members at Bangabhaban at 3:30pm today. After winning a brute majority in the 11th parliamentary polls, Sheikh Hasina is going to take oath as prime minister for the third consecutive term. Nurul Islam B.Sc. and Matiur Rahman, who were appointed ministers on technocrat quota, were axed from the cabinet before the polls to go by a constitutional provision. After achieving stunning victory in the BNP-boycotted polls in 2014, Sheikh Hasina formed the outgoing government comprising members from Awami League, Jatiya Party (Ershad), Workers Party, JSD (Inu) and Jatiya Party (Manju). Jatiya Party (Ershad), which became the main opposition in parliament, shared three ministries in the outgoing cabinet. Workers Party of Bangladesh president Rashed Khan Menon, Jatiya Samajtantrik Dal (Inu) president Hasanul Haq Inu and Jatiya Party (Manju) Anwar Hossain Manju were also shown the door. Three JP leaders — Anisul Islam Mahmud, who served the government as minister, Mujibul Haque Chunnu as state minister of labour and employment ministry and Mashiur Rahman Ranga as LGRD state minister – have also been dropped. State ministers, who have been dropped, are Mirza Azam, Biren Shikder, Ismat Ara Sadek, Meher Afroz Chumki, Tarana Halim, Nazrul Islam, Mashiur Rahman Ranga, Kazi Keramot Ali. The two deputy ministers — Abdullah Al Islam Jecob and Arif Khan Joy — were also shown the door. Joy was not given the party ticket to contest the polls.